With children heading back to school and parents waving good bye at bus stops throughout Phoenix, the last thing on your mind as your child is whisked away is a serious accident or fatality. Unfortunately, school bus accidents do happen. According to the National Highway Traffic Safety Administration, it is estimated that there are 134 fatalities every year caused by school transportation vehicles, like buses. From 2004 to 2013, 1,344 people lost their lives as a result of school bus accidents. Wear a seatbelt if the school bus has one. Wait until the bus has come to a complete stop and for the drivers signal to begin boarding. Look both ways before crossing the street to board a bus. Once on board the bus, do not shove other children out of the way. Keep the noise level down when riding on the bus. Make sure head, hands, and feet remain inside of the bus. >When not on the bus, stay at least ten feet away from the bus and out of the danger zone. Do not try and stop a moving bus to get something you left on the bus. Do not pick up anything you may have dropped under the bus. 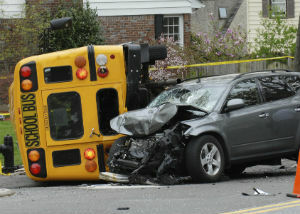 Sometimes, a school bus accident is the result of poor maintenance or a negligent driver. Defects in school buses or in other motor vehicles can be contributing factors in school bus accidents. The negligence of the school bus drivers or other drivers may also come into play. Liability for the injury or death of a child in a school bus accident could be contingent on negligence and product liability laws in the state where case action is filed. However, many states, even if they grant immunity for injuries or fatalities to the public schools that own the buses and employ the drivers, reckless or negligent driving is typically not covered by this immunity. With private schools, drivers may be found to be negligent as well as bus maintenance companies and lawsuits may be filed. Our team of bus injury lawyers are prepared to help you if your child has been injured or died in a school-bus-related accident.